The global cryptococcosis market has been foretold by the analysts at Transparency Market Research (TMR) to be pioneered by a small number of companies rooted in the developed geographies of the world. Holding an extremely fragmented nature, the global cryptococcosis market had Janssen Biotech, Inc., Bristol-Myers Squibb Company, Valeant Pharmaceuticals, Inc., and Pfizer, Inc. secure a combined 41.0% share in 2015. Leading players have been expected to sustain their dominance in the global cryptococcosis market by adhering to factors such as lofty investments in research and development and enhanced brand name recognition. Proliferation of operations in developed regions which bear higher awareness and demand could also a strategy adopted by players to cement their status in the global cryptococcosis market. 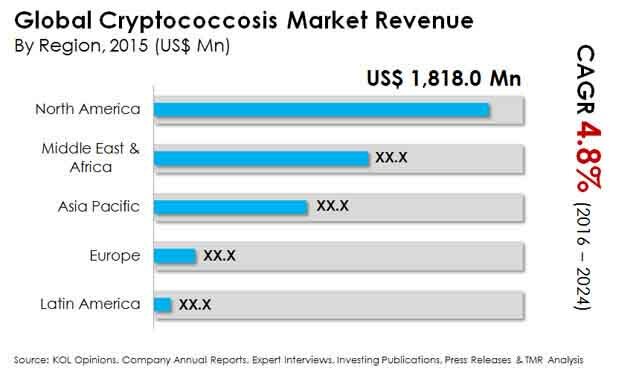 According to a market intelligence report released by TMR, the global cryptococcosis market has been forecasted to reach a valuation of US$6.2 bn by 2024 from US$4.31 bn in 2016 at a CAGR of 4.8% between 2016 and 2024. By treatment, the global cryptococcosis market has been foreseen to witness the flucytosine segment earn revenue at a higher CAGR of 5.4% during the forecast period. North America could dominate the global cryptococcosis market with an exact 50.0% share by 2024. The basic factor that has been prognosticated to work in the favor of the global cryptococcosis market is the rising number of patients infected by the fatal fungal disease. The healthcare sector is aware of the fact that cryptococcosis is spreading at an alarming rate across the world, which could benefit the global cryptococcosis market. Players in the global cryptococcosis market may be aware that the Centers for Disease Control and Prevention (CDC) has spotted the disease to be responsible for a 625,000 death count and close to a 1.0 mn new cases. Amphotericin B plus oral flucytosine, presently the golden yardstick for cryptococcosis treatment, has been projected to be in the vanguard of the demand in the global cryptococcosis market. Government efforts directed toward the development of pipeline drugs, availability of advanced treatment alternatives, and improvement in the distribution of existing drugs have been prophesied to propel the growth in the global cryptococcosis market. With last-stage HIV patients developing the disease, the demand in the global cryptococcosis market could increase further. The significantly high mortality rate of patients with the disease could be one of critical aspects of the cutback in growth of the global cryptococcosis market. The authors of the global cryptococcosis market report have pointed out cryptococcal meningitis and pneumocystis pneumonia as the top two fungal infections causing deaths worldwide. Moreover, HIV patients diagnosed with cryptococcosis combine a nearly 100.0% mortality rate, which could be menacing for the global cryptococcosis market. Thus, it has been envisaged that the global cryptococcosis market will have a very little scope for developing pipeline as well as existing drugs. Consequently, the gush of generics and impending patient expirations could degrade the demand in the global cryptococcosis market. Howbeit, the analysts envision the global cryptococcosis market to repair its growth as integrated facilities are installed in regions with an all-time high penetration potential. As a result, pharmaceutical competitors in the global cryptococcosis market could sustain their position while augmenting production speeds and curbing operational costs. Mergers and acquisitions and strong investment inflow have also been anticipated to set the tone for the global cryptococcosis market.